Here at Intasound we have an in-house repair department, carrying out various types of repairs to both stringed instruments and electronic goods. Our service department has been operating for over 30 years and we are proud to be Leicesters only music shop to offer these services in store. 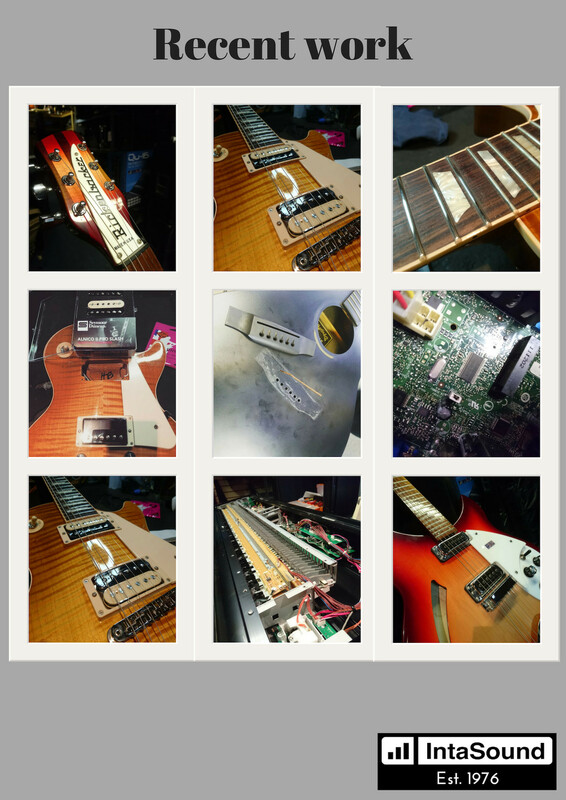 From changing a single string to a full rewire and set up we have got you and your guitar covered. We offer all aspects of electronic servicing and repair work for most major brands and working closely with some of the UK's biggest musical distributors we can source exact replacement parts and not just matching components. We also offer a call out service for those bigger musical items such as pianos, organs and installed speaker/PA systems. For any repair inquiries, please contact us on 0116 4422564 or email us at intasoundmusic@gmail.com with details of your requirements and we'll be in touch. All work is subject to a £20.00 booking in fee and, for call outs, a fee of £45.00 must be paid in order to confirm your booking. Both of the above fees are deducted from the final bill and cover our engineers time and costs associated with providing an estimate for repair. This fee is NON REFUNDABLE if estimate is refused or call out cancelled without reasonable notice given.